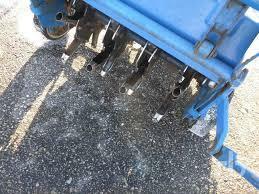 The machine is simple to use and features a working width of nearly 18" to aerate over 20,000 square feet per hour. The 424 is easy to maneuver, while the built-in lift handles and removable front weights assist in the loading process. The clutch lever is integrated into the folding handle, and easy-to-use depth controls give precise and consistent coring depths up to 3". * Please call us for any questions on our lawn aerator plug style rentals in Austin Texas, serving Round Rock, Georgetown, Pflugerville, Cedar Park, Buda, Kyle TX and surrouding communities.